"The low pressure area over northwest and adjoining west central Bay of Bengal off south Orissa and north Andhra Pradesh coasts now lies over north Andhra Pradesh and adjoining south Orissa and south Chhattisgarh. It is likely to move west-northwestwards" - IMD bulletin for Thursday evening. The low, well marked by now, is at 994 mb. enough to give meaningfull rains along its track.It can deepen a bit more on Friday, before starting its inward journey . With the movement of the system ,rains could be expected along the path, that is thru North A.P, Orissa, Chattsigarh from Thursday evening and moving into Maharashtra and M.P from Friday. I see concentrated heavy rains in M.P. and Northern Maharashtra regions on Saturday. 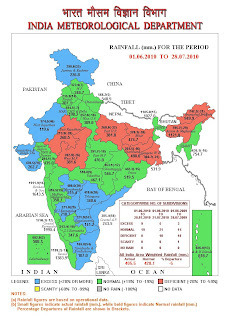 As anticipated, now with the weekly monsoon report (as on 28th July), we see the previously "Red" regions in the central states have turned to a favourable "green"
The deficit now drastically reduced to-5%. Our poll results should end here now, with -5% as the final result. With .37.% voting for this number, we see it in the 1st position as the most voted . Mumbai, lull (in rains) period seems to be over ! 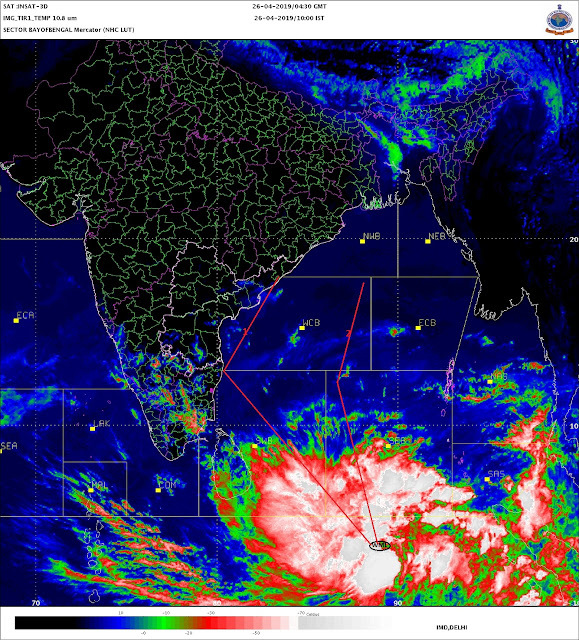 Increase in rains, as the low has crossed the coast in the east. Gradual increase now till the weekend. I see very heavy rains culminating on Sunday/Monday as the system moves in closer to Mumbai. Friday will be occasionally wet with moderately heavy showers,some prolonged and mostly in the pre noon peroid, about 30 mms. Saturday will be cloudy, with showers in the afternoon time. Evening may see an odd shower. Rain 25 mms. But Sunday rains will increase to 35 mms, and peak on Monday, with heavy rains during the daytime, to around 60-75 mms. (Forecast valid/subject to change if system deviates from expected/estimated lines). Mumbai Colaba received 59 mms in the 12 hrs till 8.30 pm on Thursday, and S'Cruz 29 mms in the same time gap. Was a bit taken aback and surprised when i heard thunder around 3.30 pm today in south Mumbai. Was i imagining it, or was it some other urban city noise? Please confirm if anyone had heard thundering ? Recorders of "thunder in Mumbai" please clarify ? Talking about Thunder - do you think Mumbai will witness Thundershowers along with heavy rains during the next 2-3 days due to this low? I personally think there is a very high chance of that happening, but I don't understand weather as good as you do. METD Weather has an interesting comment - the 'low' in MP would move in the SW direction. Wouldn't that be that a non-typical path? The lows typically move in the NW or WNW direction, have never seen a low move in the SW direction. What is the 'Vagaries of Weather' opinion on this one?